When the mercury skyrockets, Portlanders hightail it for the water en masse. One problem: it often seems like everyone goes to the same places. Even our vast wilds start to feel a little claustrophobic. And that makes no sense, because Oregon has more breath-stealing waterfalls, secluded lakes, and rollicking rivers than almost anywhere else. You just have to know where to look. 1 hour 40 minutes from Portland; difficult but short scramble to the water; moderately secluded. 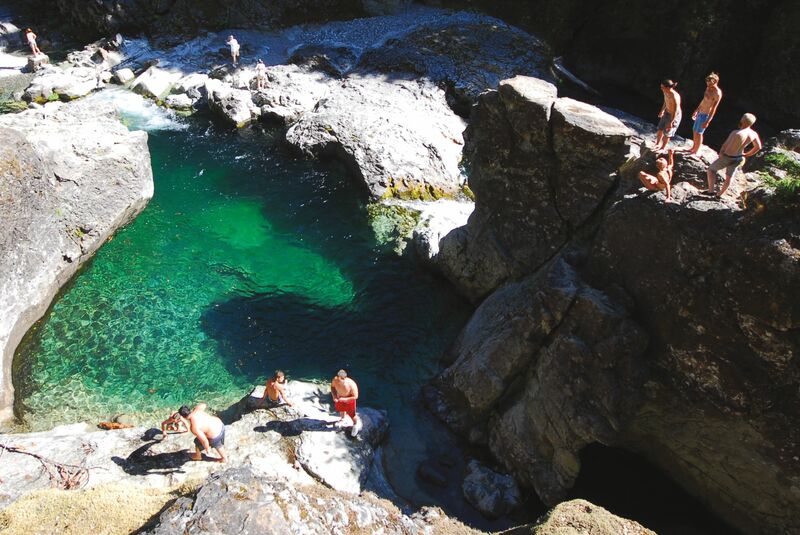 The journey to Cliff Pool is not one for the faint of heart: it hides at the bottom of a quick but truly treacherous, all-fours descent, after a winding drive through the Willamette National Forest southeast of Portland. But once you’ve conquered this challenge, your worldly worries melt away as you settle into your own little slice of Oregon splendor. 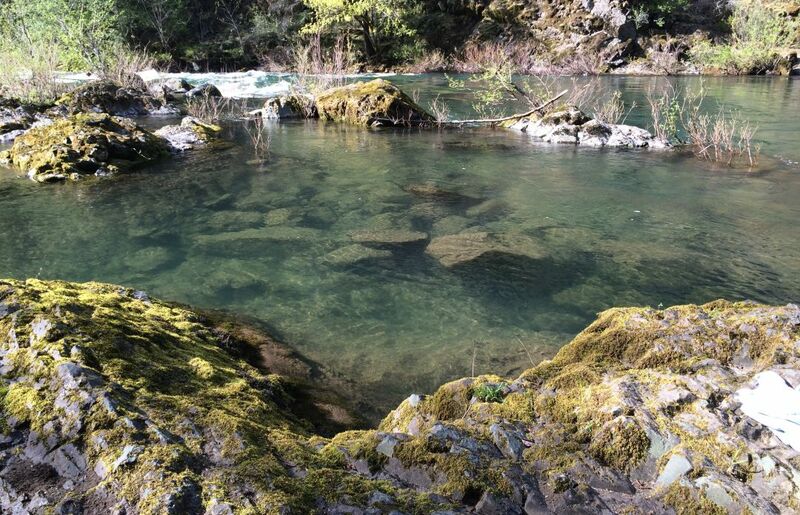 A picturesque, six-foot waterfall defines this spot on the North Fork of the Santiam River, carving out a wide, smooth bowl in the rocks—ideal for swimming and diving—while a rocky riverbank provides real estate for sunning and spying rainbow trout in the crystal-clear water. 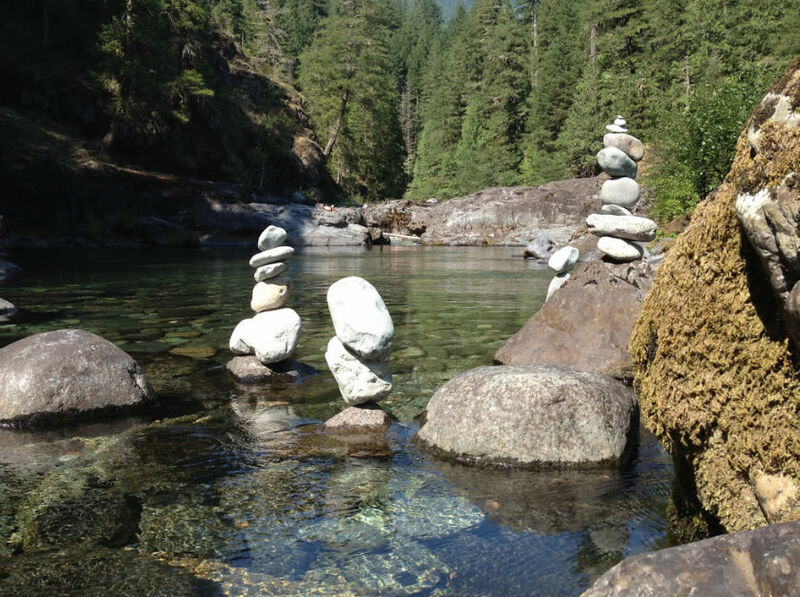 While You’re There An easy three-mile hike in from the Opal Creek Trailhead, the Opal Creek Ancient Forest Center at Jawbone Flats holds summer workshops and backpacking expeditions for kids, with four cabins available for rent from April till November. Eat and Drink At Salem’s Gilgamesh Brewing, the sprawling back patio on Pringle Creek makes an ideal spot to sip an ice-cold microbrew. 2 hours from Portland; easy hike, less than a quarter mile; moderately crowded. Rarely does a buttery-smooth paved road and a five-minute jaunt from the car lead to a densely forested lakeside retreat free of RVs and motorboats. But Wahtum Lake is a case apart. A serpentine drirve with vistas of Mount Hood’s northeast face ends abruptly in pristine wilderness. Descend a winding staircase through hemlock, Pacific yew, and huckleberry to reach the glassy waters. Lakeside campsites are plentiful, and hiking options—including a stretch of the Pacific Crest Trail—abound. Take the four-mile round trip up Chinidere Mountain for a close-up of Hood. 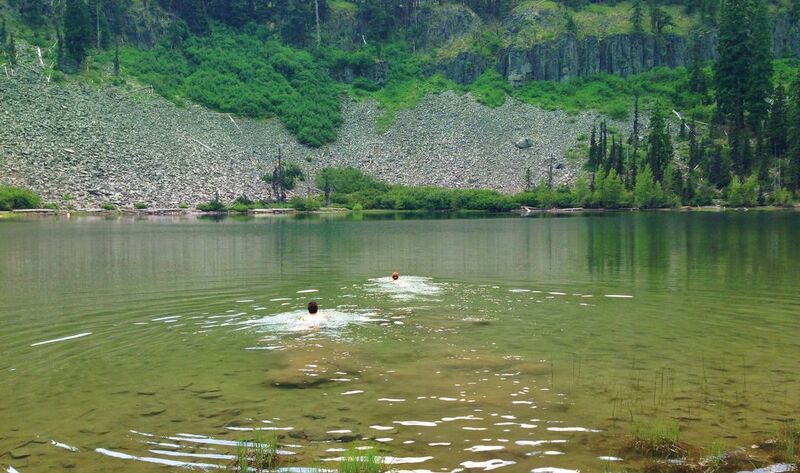 While You’re There Wahtum Lake sits at the headwaters of Oregon’s famed Eagle Creek. 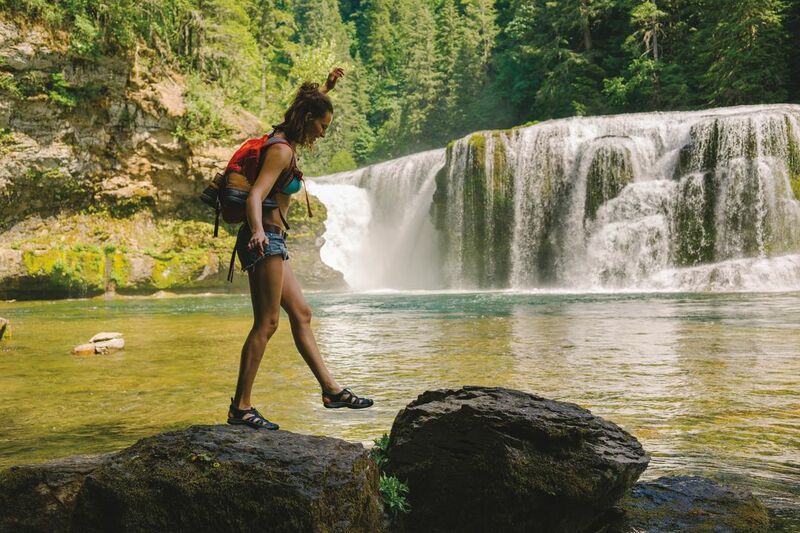 Turn your trip into an overnight backpack by hiking up Eagle Creek from the Gorge, passing 14 miles of roaring cascades, from Punchbowl Falls to Tunnel Falls. 2 hours from Portland; easy half-mile hike; moderately secluded. Nestled in a thicket of evergreens in a remote swath to the southeast of Mount Hood, Boulder Lake is uncommonly still; if someone swats a fly across the lake, or an eagle swoops overhead, you’ll hear it. 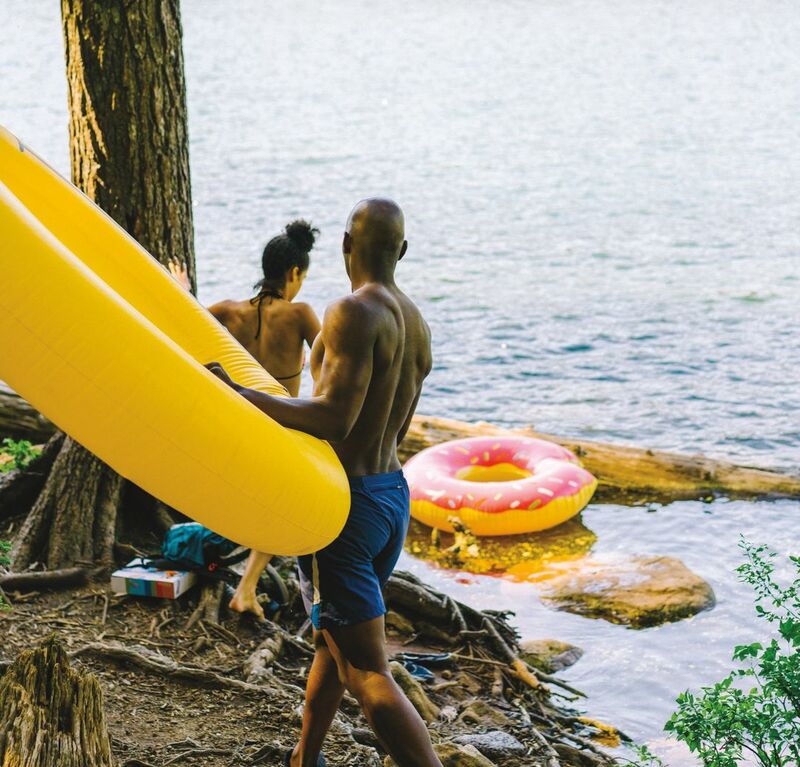 The 13-acre pool sits at the base of soaring scree slopes, with a sequence of rustic campsites, some with picnic tables, tucked in the woods of its east and south shores. Travel light for a day of basking, swimming, and fishing, or pack a tent and stay the night. Twilight here is stunning. While You’re There Ski and swim in one day? With Mount Hood less than an hour from the lake, summer skiing at Timberline’s Palmer Glacier is well within reach. 2 hours 30 minutes from Portland; easy, 1-mile hike with difficult route-finding; secluded. 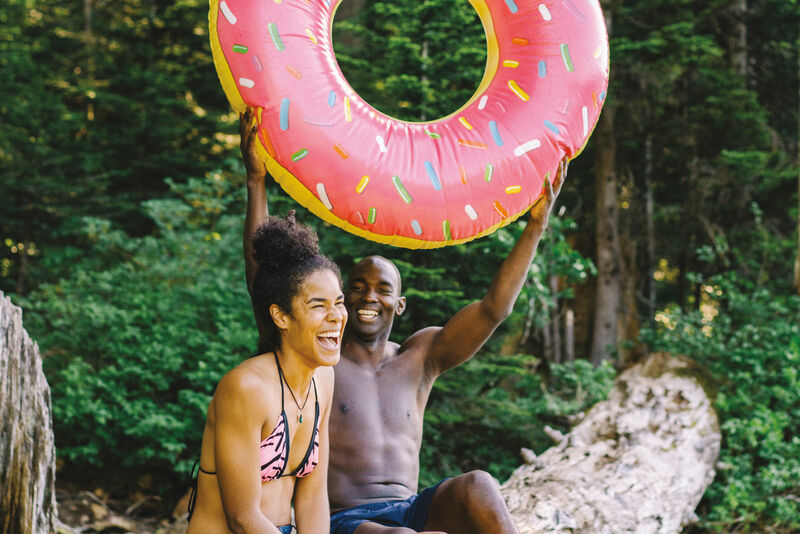 Every time Portland Monthly publishes a swimming holes article, at least one genuine, well-kept secret fuels an almighty Internet-comment backlash from the elect few who already knew the place. So here we go. 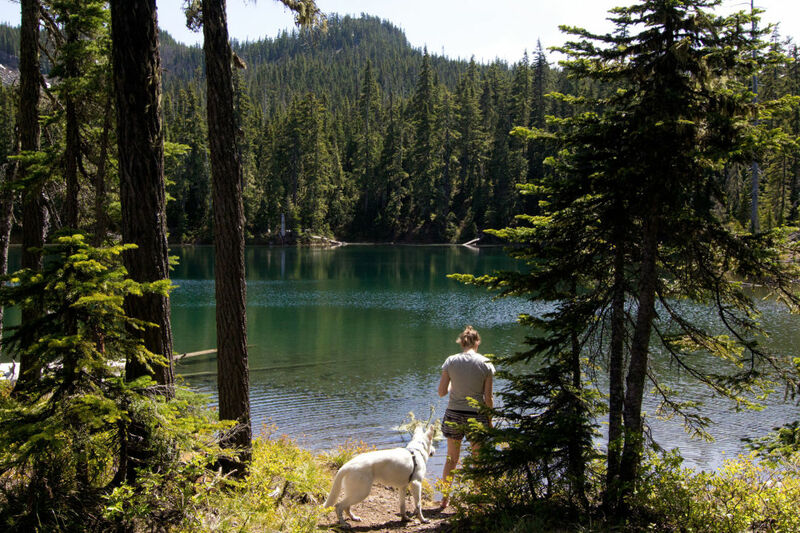 A gem in the crown of the 200-lake Olallie Lakes, a scenic area roughly between Mount Hood and Mount Jefferson, Gifford offers aqua-blue waters, campsites with 270-degree views, and private-island seclusion. But getting there involves following an unsigned, overgrown path that doesn’t exist on most topographic maps. Start at the Lower Lake Trailhead, take a left at the four-way intersection past Lower Lake, and hike less than a half-mile more until you reach a tree marred by hatchet marks. Follow the overgrown trail on your left a few hundred feet to paradise. We’ll take the flak. 2 hours from Portland; easy water access upriver, but a difficult, short scramble directly to the falls; moderately crowded. Photographs just don’t do this place justice. A wall of water, 200 feet across, gushes from 43 feet high into a turquoise plunge pool big enough to shelter Shamu. With a crazy (but not death-wish-crazy) vertical drop from the rim and smaller pools etched into pockets of the rock wall, this is a cliff-jumper’s paradise. 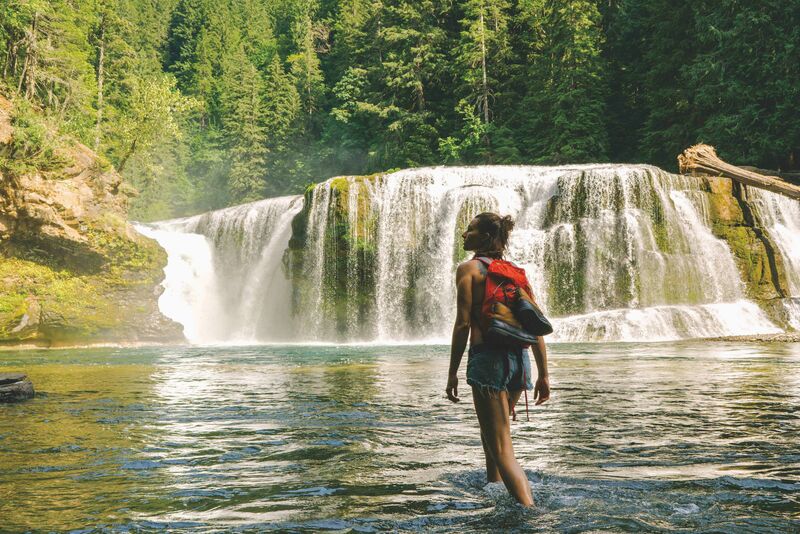 Hike east upriver through lush old-growth forest to discover Middle (1.5 miles) and Upper Lewis River Falls (about another mile on), stunning in their own right and ripe for swimming if the lower section is overcrowded. 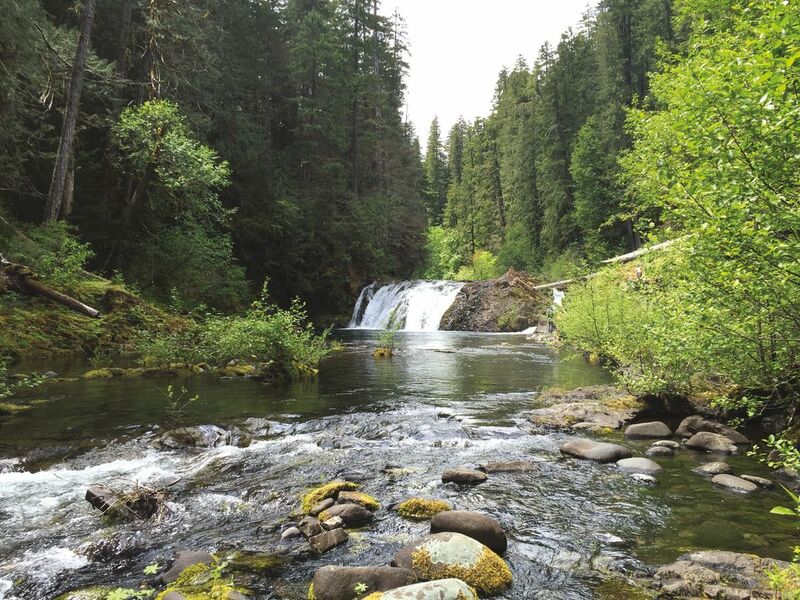 While You're There Hike east upriver through lush old-growth forest to discover Middle (1.8 miles) and Upper Lewis Falls (2.8 miles), stunning in their own right and ripe for swimming if Lower Lewis is overcrowded. 3 hours from Portland; crowded. 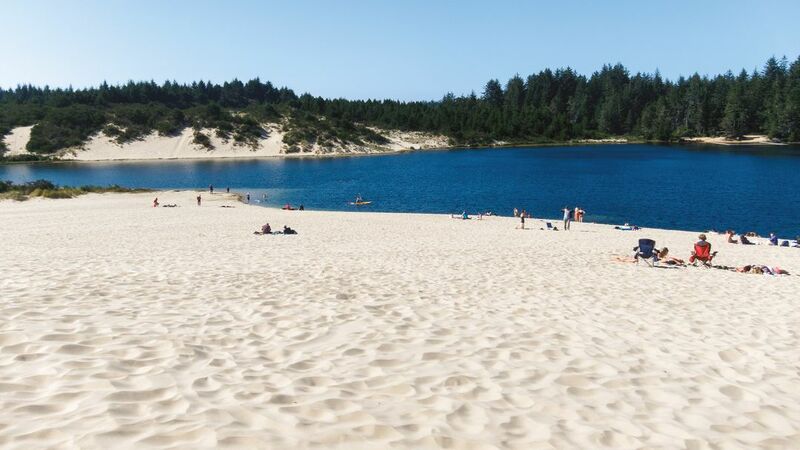 With dunes on one side and leafy forest on the other, the sandy-bottomed Cleawox Lake, inside the Oregon Dunes National Recreation Area, offers sun and shade for swimmers, paddlers, and fishers (the lake is stocked through spring with trout). A sandy beach and roped-off shallow zone, just an easy stumble from the parking lot, become kid central in the summer. Once the youth tucker out, catch the sunset from the Eye of the Needle sculpture on the lake’s eastern shore, or drive to the nearby South Jetty to watch it set over the Pacific. Eat and Drink The Waterfront Depot, a classy bôite (really!) perched on the Siuslaw River, is Florence’s go-to for anchovy and manchego tapas plates, flatiron steaks, and, of course, fresh seafood. While You’re There Even if you don’t shell out to actually enter the Sea Lion Caves (which every Oregonian needs to do at least twice: when the cave is full, to be awed, and when it’s empty, so the kids can learn about disappointment), its gift shop on US 101 is a roadside must-stop for travel toys, saucy magnets, and fresh popcorn. 1 hour from Portland; easy stroll from parking area, but steep scramble to the river in some spots; moderately crowded. 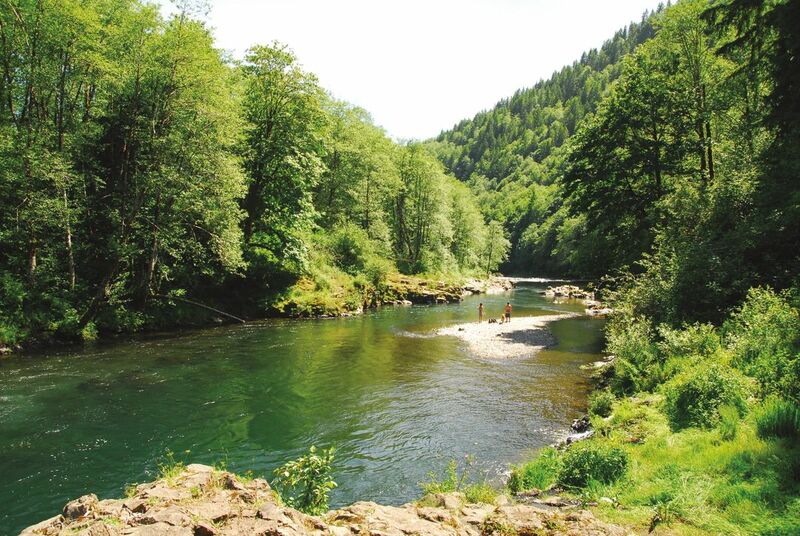 As you head west from Portland to the coast, a quick turn at Highway 6’s milepost 18 leads sweaty carloads to a relatively still, wide section of the Wilson River, near where it meets trickling Keenig Creek. Rock steps fit for Q*bert and a rope hanging from the bridge offer a variety of heights from which to jump in and cool off, while risk-takers launch from the bridge deck itself. 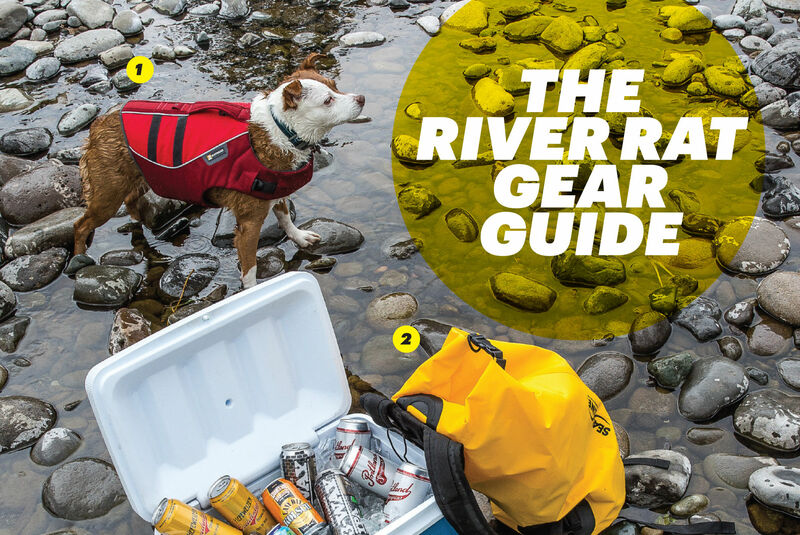 For pleasures less vertical, a rocky bar in the middle of the river is perfect for wading. 1 hour 40 minutes from Portland; easy hike of a few hundred feet; moderately secluded. 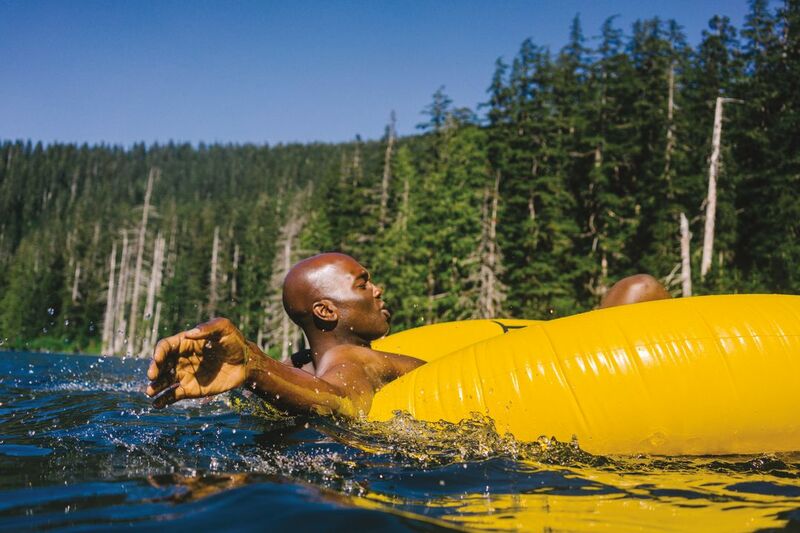 Tucked away in the same enchanting swath of the Mount Hood National Forest that contains Buck Lake, Timothy Lake, and Alder Flat, Pegleg Falls enjoys a more serene, off-the-radar status than these primo—but oh-so-well-known—spots. (The lack of signage certainly helps.) Just park your car at the “Road Closed” sign a few miles upstream of the Bagby Hot Springs campground on the Collawash River, and after a short stroll you’ll be treated to a 60-foot-wide pool at the bottom of a 15-foot waterfall. Flat rocks flank the pristine basin, dense foliage conceals it from the road, and a fish ladder carved into the bedrock beside the low-slung falls offers prime scrambling territory. 2 hours 30 minutes from Portland, moderately steep paths from the road. Prime territory for a family of dyed-in-the-wool river rats looking to homestead, this fork of the state’s 187-mile artery is too far afield for the masses looking for a speedy escape from town. 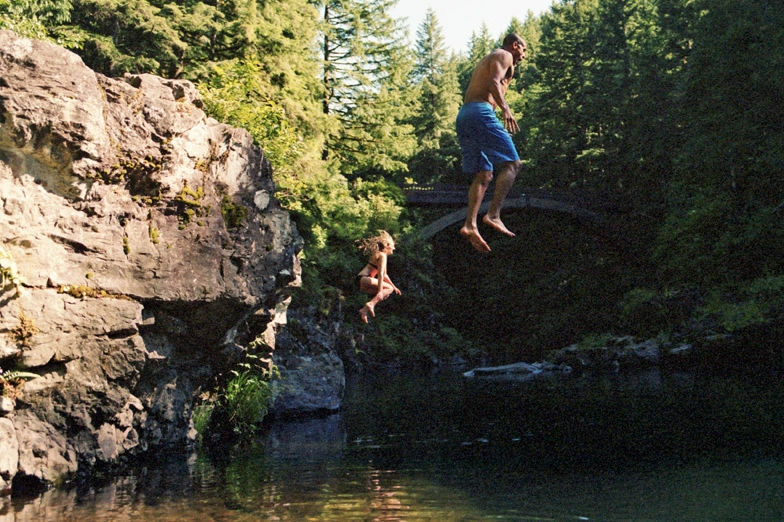 Look for sweet spots 1.4, 3.5, and 11 miles east of Lane County’s Westfir Covered Bridge, with protected pools of super-clear water and big boulders for sunbathing and lounging. If things get tight—and they sometimes do, owing to the river’s proximity to Eugene—simply drive a few miles farther to find a secluded patch of your own to call home.